I have a predisposition for featuring a couple brands and online retailers, I make no bones about it, however it is only because of my personal interest and experience with them and nothing else. So here I am featuring the pairing of Stylecreep and Standard Reference Materials again. 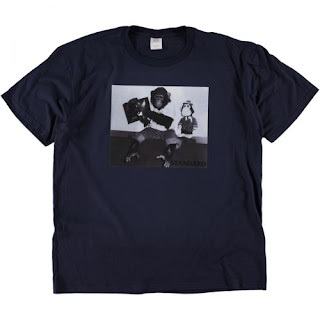 Stylecreep are offering 25% off for the Bank Holiday period on all t-shirts, shirts and shorts. As the weather seems to have finally turned it's a great way of updating your summer wardrobe. Whilst I'm sure there are plenty of you who will enjoy browsing the fifty or so brands I'm drawn to Standard Reference Materials. They guys are putting out brilliantly eclectic designs fairly frequently, including ones of a horror movie theme this past week. For fans of the brand and of street-wear in general however the very latest might be the most copacetic to date. Following the garbage Supreme x Michael Jackson drop yesterday, Standard Reference Materials have supplied their own alternative featuring Michael's pet chimpanzee Bubbles. 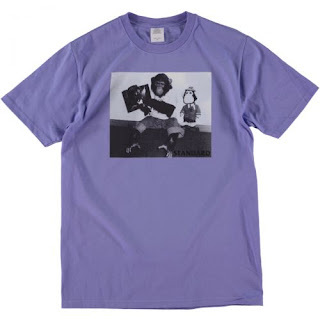 Available in Lilac and Navy with arguably an even more iconic photo than the one used by Supreme you either love it or you don't. As expected the Supreme design sold out within minutes so you can be sure there'll be plenty of Hypebeasts rocking it this summer, so take advantage of the sale (and free shipping on orders over £40) and be different. Just don't sleep on this alternative as this type of print doesn't hang around for long and is unlikely to see a re-release. Note - I am working to get an interview with SRM so watch this space.